Now order REAL TIME: SIEGE AT LUCAS STREET MARKET online! 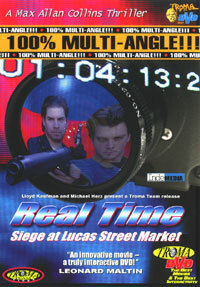 Click the image above to order Max's new movie, REAL TIME: SIEGE AT LUCAS STREET MARKET from SendMeMovies.com. Only $15.98! Captured Live! January 14, 2000, Davenport Iowa. Seeking drug money, two armed robbers seize control of a convenience store, and a simple hold-up escalates into wholesale homicide! The clerk and five customers--a pregnant woman, a businessman, a teenage girl, a mother and her young daughter--are taken captive, and the siege at Lucas Street Market is under way. Assembled entirely from security camera, squad-car cam and news team footage, all available through DVD's Multi-Angle feature, "Real Time" is a unique experiment in non-stop terror that takes you inside a hostage crisis. Written and directed by the best-selling author of "Saving Private Ryan" and "The Road to Perdition." From the award-winning filmmakers behind the acclaimed MOMMY ("Chilling!" Leonard Maltin), REAL TIME is the first feature to fully utilize the interactive potential of DVD, with an alternate view for every shot . . . making REAL TIME a movie that can be watched again and again . . . and never the same way twice!